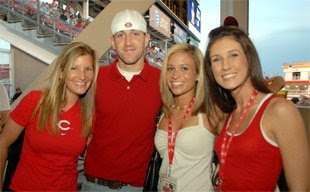 Tonight is Singles Night at the Reds vs. Brewers game tonight. First pitch is at 7:10pm, but the fun starts at the Fan Zone (behind the first base concourse) with a dating game, that will award a variety of prizes to contestants, at 6:30pm. Plus on top of all this singles fun the Reds are playing some great baseball. The game will most likely pit Cincinnati’s pitcher/hitter Micah Owings (1-3) against Milwaukee’s Braden Looper (2-1). We’re also fighting with the Brewers for second in the NL Central…so get out there and support your hometown team. A $5 beer will be available in all locations except Machine Room Grille, and a specialty drink will be available in all locations except the All-You-Can-Eat Seats. Be sure to stop by the Fan Zone when you arrive to the ballpark to pick up your wristband in order to take part in the Chipotle Singles Night festivities.